All Access utilizes KETIV's weekly training webinar; Autodesk Virtual Academy (AVA) to continue building their skills. It’s mid-January of 2018 and the All Access team is in the midst of designing, manufacturing and sending stage pieces out for delivery and setup. Each of the three warehouses they occupy in Torrance, CA is manned at all hours of the day and night, Monday through Saturday. Every machine, employee and space is utilized to its maximum capacity. There is no “try,” “maybe” or “can’t,” even though 30% of the stages All Access builds have never been created before. If you can dream it, All Access can create it. During this time of year, All Access is guaranteed to be preparing for the Super Bowl Half Time Show. This year, 6-time Grammy Award winner, Justin Timberlake took the stage in front of over 100 million people. Joey Brennan, All Access’ Technical Design Department Head, explains that they are accustomed to working under extremely tight deadlines and adapting to rapidly changing working environments. 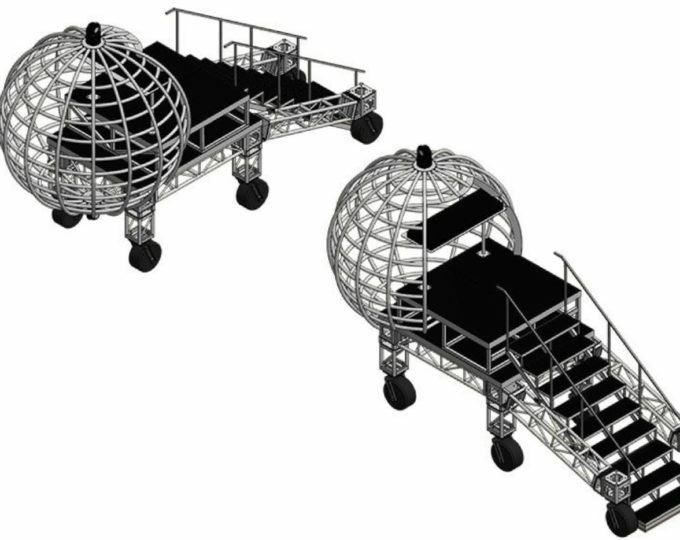 Three weeks before Lady Gaga’s Halftime show, Nick Vogelpohl, All Access’ Technical Designer, received an email regarding a central stage piece known as the Piano Dome. Nick and the team were instructed to halt all production on the Dome. Luckily, All Access uses Autodesk Inventor to design the custom staging pieces they manufacture. Through the Dome’s evolution, the design underwent a number of iterations, including a design that incorporated custom handrails made to resemble wings. Inventor made it easy to revise and update the new sketches, depending on what worked. On January 16, the design was approved and sent to be built. On January 21, 2017, the Piano Dome was shipped to Houston, Texas and seen by 111 million people on TV as part of the LI Super Bowl Halftime Show. Looking for webinars that can improve your workflow? All Access is a proud partner with KETIV Technologies. “Dependability is something All Access prides itself on and it’s what we look for in those we work with. That’s why we trust KETIV to support our CAD team.” – Joey Brennan, All Access’ Technical Design Department Head. All Access utilizes KETIV’s weekly training webinar; Autodesk Virtual Academy (AVA) to continue building their skills. AVA provides them with the knowledge they need to stay up-to-date with new features and insights to improve workflows. They also use KETIV’s Lifeline Support to help them stay at peak efficiency. From those sitting in the back of the arena, to the stage hands unloading or crawling under the stage, All Access vows to give everyone a great experience. In Joey’s eyes, if a fan is completely and joyfully immersed in the spectacle of the performance, they’ve done their job. To see All Access’ work, be sure to watch Justin Timberlake’s Super Bowl LII Halftime Show on February 4th, 2018.